Save your search - find out immediately when "Demography" is available at auction! Williams, William (1731-1811) Signed Receipt and Clipped Signature, 1773-1774. 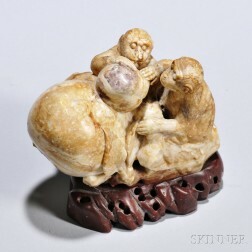 Chinese Soapstone Longevity Carving, 20th century, designed as two monkeys inspecting a peach, a sign of longevity and immortality, ht.